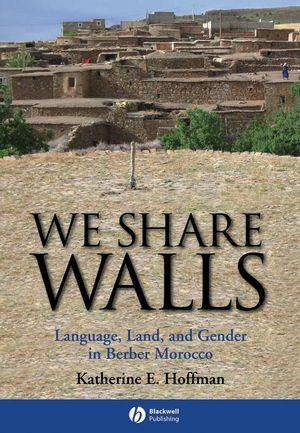 We Share Walls: Language, Land, and Gender in Berber Morocco explores how political economic shifts over the last century have reshaped the language practices and ideologies of women (and men) in the plains and mountains of rural Morocco. Katherine E. Hoffman is Assistant Professor in the Department of Anthropology at Northwestern University. Her focus is on linguistic and sociocultural anthropology, ethnicity, indigenous people, and endangered languages. She has published articles in a range of journals, including American Ethnologist, Ethnomusicology, and the Journal of North African Studies. "A beautiful and deeply researched ethnography that elucidates how performance genres like talk, song, and poetry create a sense of place and a particularly Berber (and gendered) response to modernity." "A richly detailed study of the changing politics of language in Morocco. Hoffman deftly shows how Berber women's everyday labour keeps alive the homeland and mother tongue that are the charged objects of migrant men's nostalgia and identity. This is linguistic anthropology at its best, and broadest."